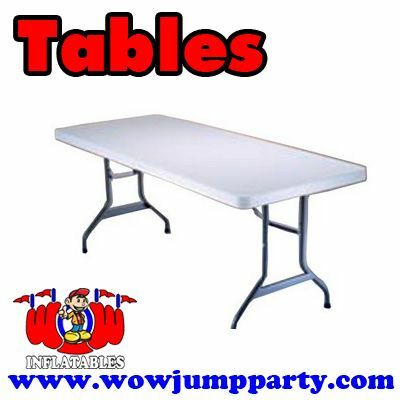 Tables - This table is perfect for your next banquet, event or group gathering. This table is perfect for your next banquet, event or group gathering. The Fold-In-Half Table is constructed of high-density polyethylene and has a convenient folding design for easy transport and storage. The lightweight design and convenient carry handle make it easy for anyone to set up and take down. This table is perfect for your next banquet, event or group gathering. What is a party without somewhere to sit. Don't worry we have you covered. A MUST HAVE for any outdoor event, the tent. Our tents are 10 x 10 and they provide the perfect amount of shade for any event. This exciting Kiddie Water Slide is fun for all children. Cool off as you slide down and splash! Our Tropical Water Slide will be great on a HOT summer days! Riders slide down onto a 15' landing area. It's 32' of slippery water slide fun.